RS Country have a really interesting piece up about the forthcoming new Jason Isbell album which talks about its politics, the label it’ll be out on and its overall sound: “New songs. Rock & roll influences. Danceable tempos. A collaborative dynamic that shines a spotlight not only on the frontman, but on the band behind him, too. 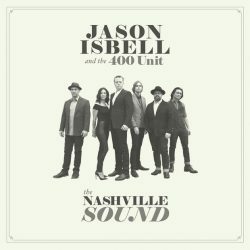 Jason Isbell and the 400 Unit’s upcoming album The Nashville Sound will unveil all of the above on June 16th, hitting stores two years after the songwriter’s Grammy-winning Something More Than Free. Backed by an international tour that includes five headlining shows at the Ryman Auditorium in October, it promises to be one of the year’s biggest Americana releases. Details are still scarce, however. A short snippet of noisy, orchestral rock, which played beneath a teaser video released earlier this year, along with a cryptic list of what appear to be song titles tweeted by Isbell’s label Southeastern Records, are the only real hints at the album’s contents. So, three months before the release of The Nashville Sound, what do we really know about the highly anticipated project? It’s a proper band album. The 400 Unit’s current lineup – keyboardist Derry deBorja, drummer Chad Gamble, bassist Jimbo Hart, fiddle player Amanda Shires and guitarist Sadler Vaden – has been together since May 2013, when Vaden completed the roster several weeks before Southeastern’s release. Gamble and deBorja both played on that album, while all five 400 Unit bandmates appeared on Something More Than Free. Even so, The Nashville Sound marks Isbell’s first non-solo album since 2011. The entire group appears on the album’s cover shot, and it stands to reason that the actual music will be similarly band-oriented. The Nashville Sound contains 10 songs. The political climate helped shape Isbell’s lyrics. Dave Cobb is back in the control room, reprising his role as producer. For the third time in a row, Isbell called upon Cobb to help shape the album’s sound and scope. Pictures from the recording session show the two working on guitar licks in RCA Studio A, Cobb’s historic headquarters on Music Row. Isbell isn’t giving up his independence anytime soon. A two-time Grammy winner who topped the country, folk and rock charts with his last release, Isbell avoids major labels once again with The Nashville Sound. The new album marks the third release on his own Southeastern Records, distributed with help from Thirty Tigers. It’s lyrical. . .and loud. “Lyrics and melody are still the driving force behind what we’re doing, but this time around, there’s more of a rock and roll influence,” Isbell recently told Rolling Stone. He doubled down on that promise by releasing a short teaser video for the album, too, with blasts of overdriven guitar providing the soundtrack.